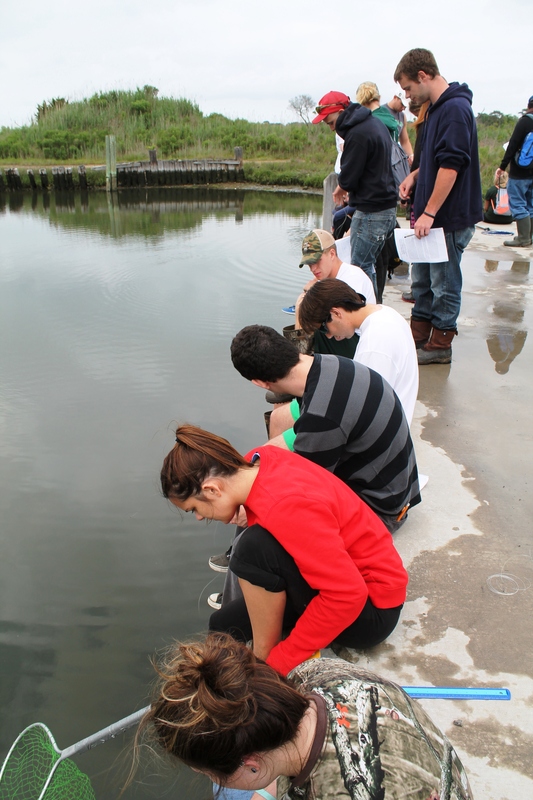 The students of York College of Pennsylvania enrolled in the summer Marine Biology 210 course traveled to Wallops Island in Virginia to the Chincoteague Bay Field Station to study marine life, particularly crab species, for three days. This was my last course to complete prior to receiving my bachelor’s degree. We arrived shortly after noon at the field station on Friday May 30th and split into three groups. Each group had their own species of crab: fiddler crabs, ghost crabs, and blue crabs. I was part of a small group of four studying the blue crabs. Fishing for and the processing of blue crabs is a huge industry for both Maryland and Virginia. 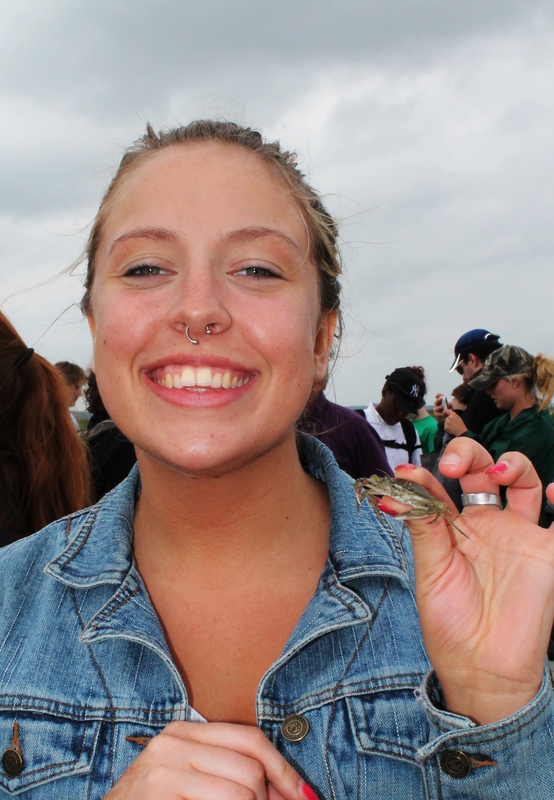 My group was interested in whether there was a size difference in the crabs on Wallops Island, which is owned by the government and closed to the public, versus the crabs found at Assateague Island, an island that is visited by countless tourists yearly. The blue crab is a scavenger, eating nearly anything it finds at the bottom of the Chesapeake Bay. We fished for the crabs on Wallops Island using chicken, shrimp, oysters, and gummy worms. The crabs ate all of it, though the chicken was the most popular bait. My group was not interested in what the crabs were eating, but the size of the crabs caught in the 25 minute time frame given. 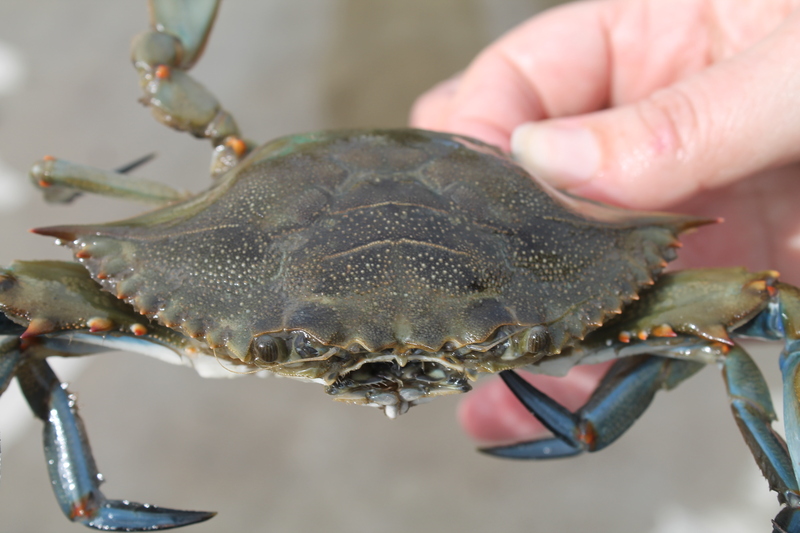 On Wallops Island, a total of 12 crabs were caught off of a dock with half being male and half female. The average size of the Wallops crab was 3.75 inches in width. On Assateague Island, 22 crabs were caught using only chicken from the banks of a running stream. Of the crabs caught, 14 were females and 8 were males. The average size of these crabs was 4.68 inches. What we learned was the crabs caught on a public island was larger than those caught on the private island disproving our hypothesis that the larger crabs would be found on Wallops because there were no humans fishing there. Possible theories I came up with to explain this were the human activity on Assateague contributed to their larger size because more food was made available to them through fishing and accidental or intentional feeding. The legal size to keep a blue crab is 5 inches. Based on the sizes of the crabs students caught at this time of year, the crabs should easily reach legal size at the height of fishing season in August. People love to eat blue crabs and they are especially good with Old Bay Seasoning. Humans are probably the biggest threat to the blue crab population, but not because of fishing. As long as the guidelines and laws are followed for crab fishing, the crabs are able to replenish yearly. The real problem for the blue crab population is the excess of nutrients found in the Chesapeake Bay that is making it difficult for the blue crabs to survive in their own habitat. There is too much animal and human waste, car exhaust and power plants that are contaminating the creeks and rivers that empty into bay and all that pollution is having a negative impact on the blue crab. The excess nutrients cause algae to grow which leads to poor water quality and low oxygen levels making the bay habitat unhealthy for the crabs. There are easy steps humans can take to stop causing the blue crabs habitat to deteriorate. First would be to cut back on the use of lawn fertilizers. These fertilizers wash away with every rain and always wind up in the running streams and rivers that lead directly to the bay. Secondly, whenever possible, carpool, use public transportation, ride a bicycle, or walk. The less exhaust released into the air, the less that will eventually end up in the water supply and dump into the bay. Lastly, plant a tree or two. Trees absorb the carbon dioxide cars create while releasing oxygen back into the air. They also absorb pollutant gases in their leaves and bark keeping them from every making it into flowing water. Sadly, if something isn’t done to keep the water that flows into the bay clean, the blue crab population will continue to decrease yearly and there will be less and less to harvest for humans to eat.